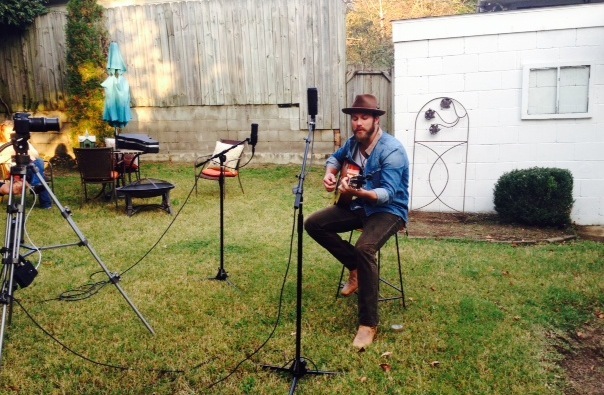 Our newest video session with Drake White, and the nostalgia that comes from both powerful songs and powerful voices. There are moments in life that can be resurrected by a whiff of a passing scent or a certain kind of light hitting the trees; the senses are better than any photograph, anyway, and more powerful in stirring up that place deep in your stomach that can conjure nostalgia, joy and the loss of temporal moments all at once. Reflection, recollection – it can be as much painful as it is reassuring, flipping through the slideshows of our daydreams, looking back on the passage of time while reveling in experiences we were once lucky to have. Sometimes, I am almost fearful of potential memories because of how much it’s going sting to look back on them. Nostalgia is a weird word and a weirder feeling – it can make you cry in a way where you never know if the tears are supposed to be melancholy or jubilant ones, tracking trail maps on your cheeks through your mascara, stopping time for a minute to mourn over moments lost and had. I’ve always been the kind of person who lives in this space too often, maybe because I’m tipped off so easily, attaching significance to sounds, smells, a certain place of the sun. But maybe we’re all that way. Maybe that’s just a human thing, or so I like to tell myself. When I heard Drake White sing (which isn’t even the most fair or accurate of words – this man can howl), stomping the heels of his boots into my unmanicured lawn, I was instantly hit with a wave of uncontrollable pre-emptive nostalgia; I knew that this was going to be a moment I’ll look back on with wistful eyes, and that when I heard his voice again some years down the road or smelled the same kind of East Nashville fall air I would remember that particular half-hour in my backyard, the way the sun was hitting the kitchen windows, maybe even what I was wearing. I’ll think of how in the past two years living in Tennessee, my life had changed exponentially and somehow put me in a place, on that grass, in this small town within a town, where I am lucky enough to notice. And I felt nostalgic for a kind of country music I listen to but have never lived – when Johnny Cash, not cash itself, ruled the industry; when country was not a four letter word. Drake White did this for me. Like his fellow Nashvillians and blog favorites Robert Ellis, Strugill Simpson, Cale Tyson, Kelsey Waldon and Andrew Combs he makes me hopeful that there is a younger generation who meld songwriting, melody and storytelling in that time-honored way and brings it to life with new eyes; they may not be the ones you’ll see walk across the stage at the CMA’s tonight, but no matter, we can all live without sequins and red soles and hair extensions. The fact that they are there to be heard and create your future mournful memories is the only thing that really counts for much. Drake might sing about always wanting what you can’t have, but in this song, in this moment, in this small town within a town, I didn’t want to be anywhere else.